Photo by go-team in the Beacon Hill Blog Photo Pool on Flickr. Need to learn computer skills? 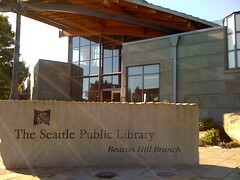 The Seattle Public Library will offer free computer classes at the Beacon Hill Library (2821 Beacon Ave. S.) during January and February. These courses include a series of classes for people who have little or no experience with computers, as well as a few more advanced classes. All classes are free and open to the public. Registration is not required, but seating may be limited. For more information, call 206-386-4636. Computer Basics 1: Learn how to use a computer keyboard and mouse. Computer Basics 2: Learn how to use basic features of the Windows software operating system. The session will cover using the toolbars, scroll bar, and text boxes. Email Basics: Get a free email account and learn how to use it, including how to send email, send attachments, and use the address book. Internet Basics 1: Learn about Web browsers and how to navigate a Web page. Internet Basics 2: Learn how to use search engines, evaluate websites, and print from the Web. Library Catalog Basics: Learn how to search the Library’s catalog to find DVDs, CDs, books, and other materials, and how to reserve and renew items. Downloading E-books & Audiobooks: Learn how to download e-books and audiobooks from the Library’s website. Web 2.0 Basics: Learn about blogs, wikis, Facebook, and more. 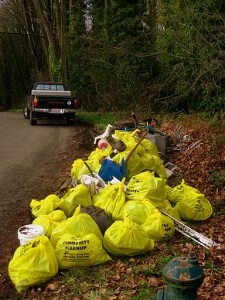 Some of the 50+ bags of garbage collected Sunday in the Valentine's Day clean-up. Photo courtesy Pat McGannon. Click for more photos from the album. The weather could not have been much better for the 17 volunteers that participated in the Valentine’s Day neighborhood cleanup that covered Mt. View, S. Edumunds, 30th Ave S., S. Ferdinand Street stairs, and Dawson St. in Mid-Beacon-Hill’s eastern edge. Temperatures climbed into the 50s and the sky held back its rain. Mother Nature even thanked volunteers with an occasional sunbeam breaking through the clouds. Volunteers worked from 10:30am through 4:30pm to collect over 50 bags of garbage, one large bin of recyclables plus 7 car tires, 6 bikes, 3 children’s big wheels, 3 CRT computer monitors, 3 computers, 2 printers, a microwave, 5 buckets, and 2 lawn chairs that had been thoughtlessly dumped on this neighborhood’s streets. Seven hypodermic needles were also removed from the streets. Additionally, contents of a stolen purse were recovered. Thank you to all the volunteers who helped to make this Seattle neighborhood a much cleaner and safer place to live! A thank you also goes out to Seattle Public Utilities for supplying the garbage bags, safety vests, work gloves, grabber tools, and post-event trash pickup! Please continue to keep the neighborhood clean by picking up litter on the street near your home each week on garbage day. The neighborhood looks great today thanks to all the volunteers! If you’re interested in organizing your own street clean-up, Pat also mentioned that you can get free supplies through Seattle Public Utilities.